I've been looking at many blooming trees this past week, following my own advice of a couple of weeks ago. They bloom so briefly and are so lovely. Here are a few. This is, I believe, Magnolia x soulangiana. Then, a little farther on, there is a magnificent Michelia doltsopa I know, "Say what?" I don't know that it has a common name, but it is lovely. 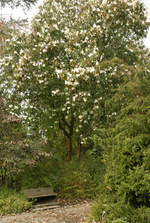 It's a relative of magnolia that is native to China and the Himalayas. 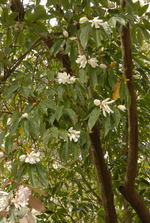 The huge white blossoms of Michelia doltsopa are fragrant. 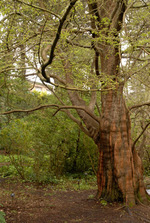 Finally, I couldn't resist including a dawn redwood just leafing out. One of my favorite trees and this is the very best time to see it. It's a relative of our California redwoods and sequoias that was discovered growing in China in the 20th century, long after it was thought to be extinct. The man who found it growing visited San Francisco a few years ago and saw our trees. Unlike our redwoods and sequoias, it is deciduous. So in spring you get the tiny, delicate leaves budding out, so tender and pale. And of course the trunk is wonderful, looking like it was macramed. There is a grove of these trees, they seem to create their own color of light at this time of year. If you live nearby, visit the garden in the next week and you will see what I mean.